In 2010, I decided to start running, inspired by a family member, who began competing in ultramarathons at age 50. 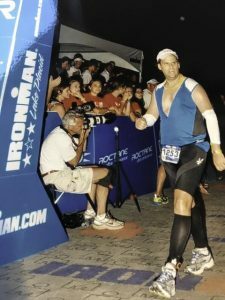 The following year, it was no surprise to family when I casually announced that it was my intention to complete in an Ironman triathlon (4 Km swim, 180 Km bike, and 42.2 Km run- all within a 17-hour time limit). Despite my relative inexperience in running and cycling, I took on the challenge of training 20+ hours a week, which often included waking up at 3:15 AM. I recall that on one occasion, a police officer asked me why I was cycling at such an absurd time of the day. On July 22, 2012, at 11:43 PM, I crossed the finish line at the Lake Placid Ironman. It was an affirmation to continue striving for goals that seemed beyond my limits. The honours of that day belonged to a 75-year old triathlete, who successfully completed the race. I went on to pursue the Ironman Muskoka in 2015, welcoming the challenges and obstacles of training for an endurance event. Mission accomplished! My personal circumstances during this time period changed; my son was born, my career became more demanding, and I was now studying for an MBA at Dalhousie University. 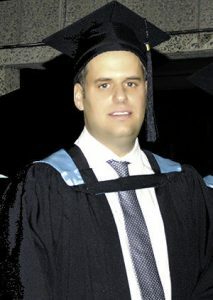 I set some onerous goals for my studies, since I have in mind to some day pursue a PhD. Despite personal challenges and the time restrictions that accompany a robust academic journey, I graduated with distinction as the 2018 Director’s Award recipient for highest academic achievement. To be clear, I have never been a gifted athlete (average at best), nor do I claim to have above-average intelligence. However, I am a firm believer that our personal frame of mind is often the largest obstacle in achieving personal objectives. Many years ago, I was involved a bad car accident. It was a pivotal moment. It was then that I resolved that I would no longer hesitate to pursue ambitious goals, no matter what life chose to throw at me. For instance, at present I am working through an injury which will prevent me from competing in a 100-mile ultramarathon this summer. Admittedly, I found myself expressing negativity about my injury; but I have since shifted my frame of mind and re-directed my energy to other ventures, which may include swimming from New Brunswick to Prince Edward Island in August. With the arrival of the new year, it is important to remind ourselves that hesitation is one of the highest forms of opportunity cost. No matter what we may think our constraints or limitations are, we can generally push ourselves further. For a little extra motivation, look up the inspiring story of Ironman Team Hoyt. Stephen J. Boyd, MBA(FS) Class of 2018, was the recipient of the prestigious Rowe School of Business Award for Highest Academic Achievement. CEGE Connection is pleased to advise that Stephen has graciously agreed to be a repeat contributor on CEGE Connection.